Discover a beautiful and relaxing destination where indulging in life’s simple pleasures is all a part of your vacation. Here, on one of Georgia’s famed Golden Isles, lies getaway full of rich history, stunning views of the Atlantic Ocean, and incredible culinary treats. Jekyll Island, a National Historic Landmark on the National Register of Historic Places, is the home of the luxurious four-star resort, Jekyll Island Club Hotel, a member of the Historic Hotels of America, and the perfect place for your next Georgia escape. The mystery behind the Jekyll Island Club Hotel extends from some of the first visitors of hunters and gatherers followed by the Guale Indians. Known as “Whale Island” by the Spanish, Jekyll Island is still known to be near whale breeding waters. Throughout history, Jekyll Island Club Hotel has served many aristocrats but most importantly struck Newton Finney and John Eugene DuBignon as a perfect place for a hunting club. Some of the most well-known members in the elite club were Henry Hyde, J.P Morgan, Joseph Pulitzer, and William K. Vanderbilt. Since the area had such a concentration of these prominent leaders, Jekyll Island Club saw many historical events take place. On January 25, 1915, the first ever transcontinental phone call was placed onsite by president of AT&T, Theodore Vail. Due to the Great Depression and tightening pocketbooks, the club’s membership declined and then during World War II with the threat of enemy submarines near the island, the island was evacuated. In 1947 Jekyll Island was purchased by the state of Georgia and became the Jekyll Island State Park. The Jekyll Island Club Hotel was restored into one of the finest retreats in America in 1986 for $20 million. Today, Jekyll Island Club Hotel opens its doors for couples, families, and business travelers year round. According to Travel & Leisure, the Jekyll Island Club Hotel is ranked among the top 500 resorts in the world. 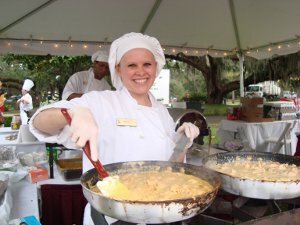 Fall is the ideal time to visit the Jekyll Island Club Hotel as the weather cools and the hotel’s chefs prepare for the annual Wild Georgia Shrimp and Grits festival. “Each year the hotel’s chefs dish up their Award winning recipe to 1000s of festival goers,” said the hotel’s Executive Chef Abigail Hutchinson. The chefs at the Jekyll Island Club Hotel specialize in world cuisine and cater to any appetite. Enjoy a delicious treat or two at the hotel’s four unique dining options right onsite. From the luxurious Grand Dining Room with Victorian architecture and river views to the Café Solterra, a cozy option for morning pastries or late-night snacks, you’ll be sure to find something that appeals to your tastes. The Courtyard at Crane presents you with a casual dining environment in a quaint cottage a short stroll from the main hotel, while the seasonal Pool Bar and Grill and Beach Pavilion both offer fun drinks and meals to enjoy while you’re out soaking up the sun and making a splash in the water. For the thrill seekers, from October 25 through October 27, it is known as Ghost Hunt Weekend at the Jekyll Island Club Hotel. Paranormal author and researcher, Chad Morin, will be presenting with the Ghost Hunt Crew along with a Jekyll Island History and Haunts Presentation. Hotel guests can partake in day trips to beautiful Cumberland Island full of undeveloped beaches and explore the National Seashore or explore the museums, lighthouses, and shops on Saint Simons Island and Sapelo Island. For the avid golfer, there are several golf courses to play a round on while taking in gorgeous ocean views or lunching on fine, gourmet food. Pamper your soul at the luxurious spa, taste tantalizing creations from the best chefs, and splurge in some shopping and historical sites around the island. Surround yourself in bliss at the Jekyll Island Club Hotel, and immerse yourself in beauty of all types: culinary excellence, exquisite courtyards, and lavish amenities. 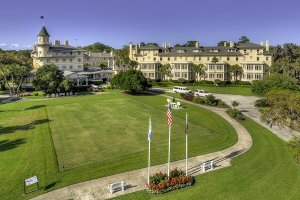 Come enjoy a 25% discount on any of the rooms and suites at Georgia’s Jekyll Island Club Hotel. Hurry, rooms are booking fast and you don’t want to miss out on this spectacular deal. See what awaits your vacation at the beautiful, compelling Jekyll Island Club Hotel.